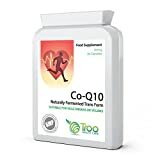 High strength trans form CoQ10 supplement derived using only 100% natural fermented processes and emulsified in sunflower oil for superior absorption and effectiveness. CoQ10 is vital in the production of energy and supports a healthy Cardiovascular and Immune System. Supplementing daily with CoQ10 capsules is an ideal way to replenish CoQ10 for people who use statins. A side effect of using statins is that it artificially reduces the CoQ10 levels in your body. Troo Health Care CoQ10 Capsules are manufactured in the UK to GMP code of practice and ISO 9001 quality assurance certification. Only the finest quality raw materials in their highest and purest form are used. These manufacturing procedures ensure that the basic manufacturing practices and prerequisites necessary for product quality and safety are being followed. This goes above and beyond what is required so that we can guarantee you receive consistently high quality products. high strength COQ10 supplement derived using 100% fermentation processed from natural food sources only. pure “trans” form of Q10 which is the form which naturally occurs in the body and is therefor more easily recognised and processed internally. safety and clinical efficacy of CoQ10 cannot be guaranteed without 100% fermentation. For that reason Troo Health CoQ10 is 100% naturally fermented. energy supply process, acting alongside enzymes (thus the name coenzyme Q10) to convert sugars and fat into energy. promote healthy cardiovascular and immune function (as cells involved in immune response have a high energy dependence). Troo Health Care CoQ10 Capsules are manufactured in the UK to GMP code of practice and ISO 9001 quality assurance certification. Only the finest quality raw materials in their highest and purest form are used.